The 2 on 1 Mid Ice Transition hockey drill consists of a small-ice game that promotes quick transition, and works offensive and defensive skills in fast-developing 2 on 1 situations. The two nets are moved forward to create a small neutral-zone playing area. Two teams are formed and line up facing each other. Next, two players from each team line up and face each other at center ice. One player from each team must always remain in the offensive zone to create 2 on 1 situations in both zones. The coach starts play by passing an elevated pass between the players, who must knock down the puck with their sticks. 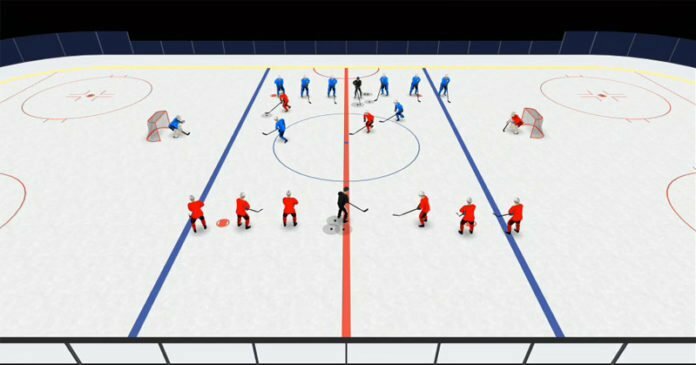 12 Rec Hockey Mistakes: Which Are You Guilty Of?